"Certified Organic through NOFA-NY, Certified Organic LLC"
Beiter and Sons' Farm is located in Western New York State just outside of Buffalo, NY. Our certified organic farm is centered on pasture raising a small herd of goats using sustainable and organic farming practices. We use our raw, organic goats' milk to create skin-nourishing soaps under our brand Alpine Made (alpinemade.com). Alpine Made Soap Shop is now open! Click on the tab above to experience our skin-renewing soaps. Try our goat milk soaps and skincare and experience a restoration to youthful skin. 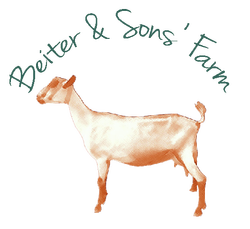 Beiter and Sons' Farm has provided my family with organic goat milk since 2010. We are certified organic through NOFA-NY Certified Organic LLC. We've grown quickly through the launch of our goat milk soap brand Alpine Made (alpinemade.com). We will expand our product lines over the years and continue to work our land in an ecologically sustainable manner for future generations. I'm grateful to have this opportunity to raise my children to care for and appreciate animals and their capacity to provide abundant food, in hopes they will pass on this knowledge to future generations. If you are not familiar with our farm and your first contact with us is online; please let us know what your questions or ideas are, we will be more than happy to respond. You can reach us at organic@beiterandsonsfarm.com or at info@alpinemade.com. Cheers to great health through the sharing of locally produced food and handcrafted products.